Photo by Antonio Tajuelo under a Creative Commons licence. Occasionally, Londonist writers take a trip, and indulge in the excitement offered by cities other than London. And because we're magnificent nerds, that puts us in a grand position to do a subway-off between London and various other cities. Today: Tokyo. There are nine official Metro lines in Tokyo, but just about everyone would consider the network to include the overground rail lines — including the very popular and indispensable Yamanote line, which does a 21-mile circuit around the city. There are also lines run by private operators, and other lines run by the national operator. It is, in short, a mess (see navigation, below), but it also means the system is huge. Even adding in London's suburban rail services doesn't bring it close. This is in part because Tokyo is all spread out, with various centres around the city instead of having a London-like compact zone 1 and spreading out in concentric circles. If you want to travel between, say, Shinjuku and the Tokyo Skytree, that's a distance of 11 miles by road and would take 40 minutes on the Metro (a combination of private rail and subway lines). An equivalent distance in London gets you from Finchley Central to Kew Gardens and takes over an hour. And we haven't even started to comprehend the sheer number of people the Tokyo Metro moves around. The Yamanote line alone carries more passengers per day than the entire London Underground network. 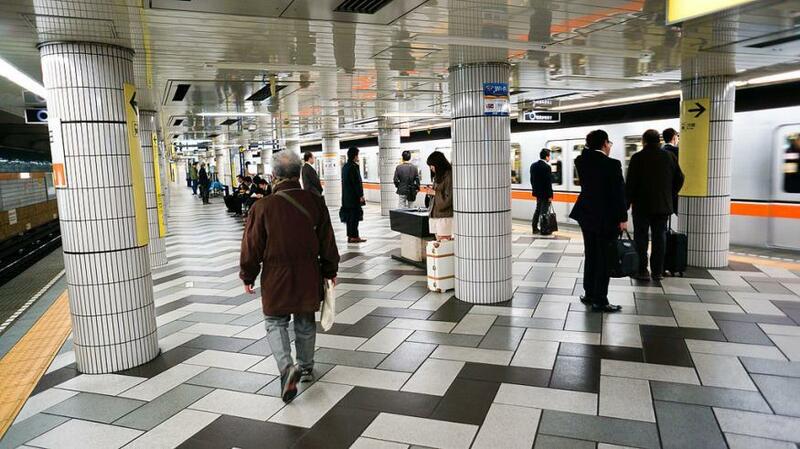 3.5 million people use Shinjuku station every day. Take that, Waterloo, with your 89.4 million passengers a year. As we said above, the Tokyo Metro system is enormous. 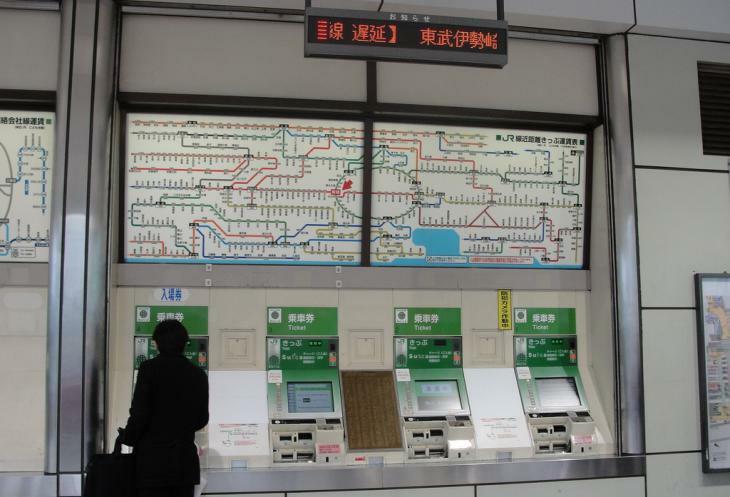 The official map includes the subway lines, Yamanote line, private subway lines and some Japan Rail lines. It makes us want to cry. And even then it doesn't include everything: there was a line we once needed to take to get out to some temple in the suburbs, and we had to find out where it connected by looking it up on Wikipedia because it wasn't mentioned on any English language map. Seriously. We also find the Tokyo subway map confusing because of how it's attempted to be simple. Each line has a symbol (in English, more or less the letter the line starts with) and each station has a number as well as a name. Except this means that sometimes the same station can have different numbers. Hibiya station is number 09 on the Chiyoda line, 07 on the Hibiya line, 08 on the Toei Mita line and connects up with Yūrakuchō (18 on the Yūrakuchō line). Being used to the most elegant subway map in the world, this feels relentlessly unnecessary. Once you've worked out where you need to go, however, the system is pretty straightforward. 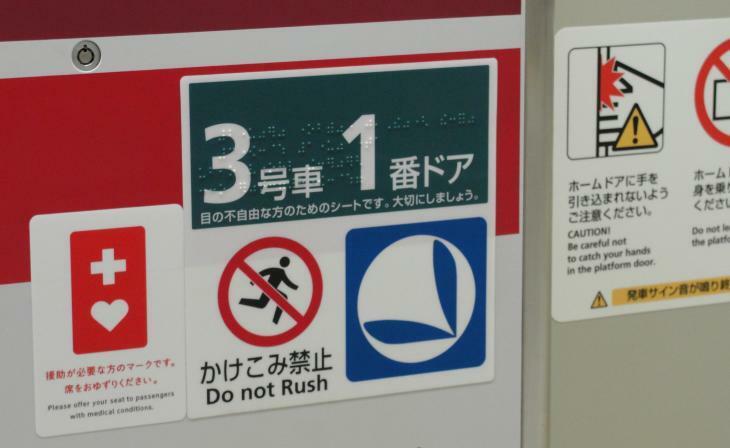 All the station signs are translated into English letters and there are announcements on the train in English. It all gets a bit more complicated when you're not on the actual train, though; Shinjuku station has 200 exits. Station platforms do have handy signs telling you what's at each exit, but still. 200 exits. This tells you the carriage and door number (as well as spooky alien eyes). That'd be very handy in London, for users of the Station Master app. Trains in Tokyo are more like metal tin cans than London's sleek white carriages, but they feel roomier inside (presumably without the constraints of our Victorian deep tube tunnels) and definitely have more standing room. Which is necessary: our friends at the excellent Tokyo Cheapo pointed us towards this document (run it through Chrome's translation widget) which shows how congested rush hour trains are. The Tozai subway line between Monzen-Nakacho and Kiba regularly runs at 199% of capacity. No wonder the stories of station staff pushing people into carriages are true. But for all that, the experience of riding a Tokyo Metro train is good. You always know where you are, announcements tell you which side the doors open and those other stories of queue lines that the Japanese quietly obey? Absolutely true. No unseemly scrum to board in Tokyo. London commuters could learn a thing or two. One other thing: the trains play little songs at each station. They appear to be unique to each station and/or line (have a listen to a few: here's one from the Marunouchi line, one from the Fukutoshin line and one from the Yamanote line). Ebisu station uses the theme to The Third Man, because the music was used in Japan on an advert for Ebisu beer. We think this is fricking brilliant — though not everyone agrees. Trains result: Tokyo wins, for the jingles alone if nothing else. Low ceilings, drab colours and, on some lines, waist level barriers that perform the same job as the glass doors on the newer sections of the Jubilee line but without the dignity. A weird preponderance of pillars. It's fair to say the Tokyo Metro is built for functionality, not beauty. Signage is plain, as is probably only fair when you're trying to squeeze in various alphabets. Even the rather lovely blue Metro logo doesn't make many appearances once you're below street level. But you can always cheer yourself up with spotting the brilliant etiquette signs. Tokyo Metro logo, by Cliffano Subagio under a Creative Commons licence. Japan's tanking foreign exchange rate makes the Metro a lot cheaper for us Brits than it used to be. London 3, Tokyo 2. Despite being Londonist we're genuinely surprised at that result, even though we decided the rules ourselves. Disagree? The comments are a mere scroll away.